Glucosamine is a natural substance in the cells of cartilage between joints. Your body produces the glucosamine it needs to protect your bones, but production decreases with age. Injuries to joints may damage cartilage and connective tissues, which increases your need for glucosamine. For joint health, you may need to take a glucosamine supplement, but let your doctor know before you begin supplementation. Glucosamine supplements are frequently used to treat osteoarthritis, the most common type of arthritis. Osteoarthritis is caused when cartilage between the joints is damaged and breaks down, notes the National Center for Complementary and Alternative Medicine, or NCCAM. Your bones need cartilage for cushioning between joints so bones do not rub against each other. While osteoarthritis usually occurs later in life, injuries that can damage cartilage can occur at any age. Glucosamine supplements can be purchased over-the counter and are available in tablet or liquid form. Glucosamine can help to reduce inflammation in your joints and relieve any pain you experience. It may help to repair cartilage damage that occurs from osteoarthritis, and can help to reduce the risk of permanent joint injuries. 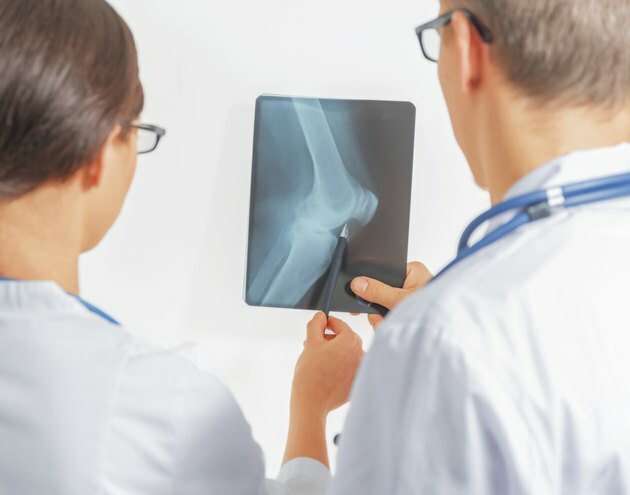 According to the American Academy of Orthopaedic Surgeons, or AAOS, taking glucosamine supplements may reduce age-related narrowing of the knee joints, resulting in less damage to cartilage. Adding glucosamine supplements to your diet can cause gastrointestinal distress, such as diarrhea, gas, bloating or constipation. You may also experience heartburn or nausea after taking a glucosamine pill. Glucosamine sulfate, the most common form of glucosamine, may cause headaches and drowsiness, explains the AAOS. If you have a shellfish allergy, you should be leery of glucosamine supplements. MedlinePlus.com reports that glucosamine is often harvested from shellfish. Many types are made from the skeletons of lobster, shrimp and crab. Having an allergy to shellfish may cause an outbreak. MedlinePlus.com also recommends that if you are diabetic you keep a close eye on your blood sugar levels, as there is a chance that glucosamine could increase them. Joint pain and swelling can often be relieved with weight loss and exercise. Osteoarthritis commonly affects weight-bearing joints such as the knees, explains the NCCAM. Changing your diet can help with weight loss, so there is less strain on your joints. Increasing your physical activity keeps your joints moving so they do not stiffen and swell up. Glucosamine often works best if paired with chondroitin. While glucosamine helps to repair tissue, chondroitin helps cartilage stay healthy by retaining water. You may have more benefits if you take a supplement that provides both substances. If you decide to change your diet, start an exercise regimen or take glucosamine supplements, talk with your doctor first to ensure you are healthy enough for these changes. American Academy of Orthopaedic Surgeons: Joint Supplements: Is There Hope Behind the Hype?